Thank you for all of your condolences at the death of my grandfather. The kids were spectacular as well and every day is a new day. He was a great man and will be greatly missed. Math – We are almost done with unit 5, my favorite unit, and will have the test on Wednesday. If your child will be absent please let me know so that they can take the test before the break. We will also celebrate the end of the unit with a pizza lunch on Wednesday. Please send in $3 with your child to cover lunch. The next unit is about collecting and processing data. Science – We are finishing up mixtures and solutions with discussion of concentration as well as trying to get the vocabulary straight. There will not be a test but rather a check-in with tools to see how much the students remember. Social Studies – I continue to be impressed by the students’ ingenuity, enthusiasm and ideas for further exploration. In my social studies class we have discussed Pocahontas Facts vs. Disney as well as had the students decide on a mini-project. To say I am impressed with their ideas is an understatement; an English settlement created in Minecraft, an Animoto presentation on their journey, various foods, and presentations all concocted by the students. Reading – Yahara continues to dominate but we are checking in with our Harry Potter. Also, this is a new trimester which means we start book talks again after break with the students needing to read at least 1,000 pages. Writing – The Yahara final drafts are due to me on Friday January 6th. Some students are closer to finishing than others; please help them with their editing. I am teaching them only to rely on spell check as a tool not as the only way to check their spelling! * We are working hard in 5th grade and I love seeing how the kids are banding together to form their community. I have the best job in the world and it is because of these kids! * Winter party will take place Wednesday, December 21st at 1:00 PM. It does not look like there will be any snow for sledding so we will just hang out instead in our classroom. * There will be no homework over break, I hope the students will blog and read but that is it. This is their chance to gear up for the second half of 5th grade. * Congratulations to all of our students in the spelling bee. I heard it was quite the intense spell off. * We have pen pals from London now. Mrs. Clarke contacted me and wondered if we would write back and forth; the kids seem to love the connection. Matthew is also using our blog to stay in touch; he left a long post detailing his new school. * Thea is actively pointing at every single toy she sees and asking Santa to get it for her. We love the holidays and cannot wait to see her face on Christmas. * I have some dates for you to put on your calendars: Winter Party is December 21st at 1 PM, winter break is from December 22nd through January 2nd, New math groups and social studies groups Tuesday, January 3rd, Yahara final versions are due to me Friday, January 6th, Geography Bee Friday, January 13th at 8:40 AM, No school Monday, January 16th and Monday, January 23rd, and WM PTO meeting Thursday, January 19th 7 PM. Way to Go Quiz Bowl Team! Fifth-graders from the six MCPASD elementary schools definitely have their thinking caps on. District teams from all six schools participated in Wisconsin's Thinking Cap Quiz Bowl competition, which took place on Nov. 15. Students competed online with other teams from around the state. The contest included 100 multiple choice questions in categories including history, spelling, math, science, English, current events, children's literature, government, sports, geography and more. Each team was given two tries on each question, with speed and accuracy on the first attempt building the highest score. Team members were chosen based on the results of a screener given to all interested fifth graders. The screener had question topics similar to those covered on the actual statewide quiz bowl. 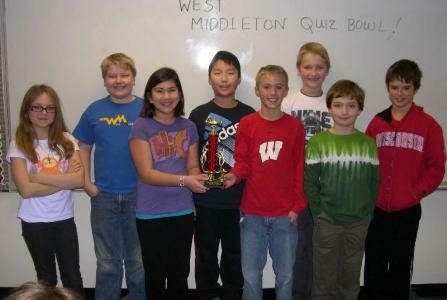 CONGRATULATIONS to the West Middleton Quiz Bowl team, which earned first place in the state! Math – We finished unit 4 and this so far the most laborious test with plenty of opportunities for the students to have silly mistakes. We were thrilled to see how many kids felt more secure in division and know that we will continue to keep an eye on all the skills. So far the test will be December 21st. Since the trimester ended, all students have to test out of fact tests again. We started these today. Science – We continue working with mixtures and solution and today discussed saturated solutions. Do you know how many grams of salt it will take to saturate 50 ml of water? Your child does! Social Studies – We finished chapter 3 “The Explorers” today and start new groups on Monday. The next chapter moves into the British explorers and will take us through break. In my room we did an hour of wonder yesterday, which was like a mini innovation day. Reading – We are focusing on discussing grades this week as well as working on the Yahara Writers Contest. Students have had little time to read in school outside of the read-aloud where Harry just got sorted by the sorting hat. Writing – I wrote more about the Yahara River Writers Contest on our website, the first draft of the short story is due on Wednesday the 7th and the final draft is December 16th. The other three categories will be discussed the week of the 12th with that week as work time. * I will be in San Francisco next weekend to visit relatives. Mrs. Johnston will be our sub. * Thank you so much for box tops, while I think Mrs. Hannam’s class did beat us we ended up with 1,001 boxtops for the school which is wonderful news for the new swing sets! * Snow gear is a necessity at this time of the year. Please help your child bring in everything they need to stay warm. If students need help acquiring gear please let mw know or contact Miss Rose. * Our winter break celebration is scheduled for the 21st of December so far. We are hoping to have pizza lunch and then go sledding after recess. It will, of course, be snow-dependent. Mrs. Sabol will be contacting those who signed up to volunteer/donate food. * Winter tea is this Wednesday, do join us if you can! * We said goodbye to Matthew who is on to new adventures in Illinois. He will be missed. * Spelling bee is next Friday. Kyra, Sophia Ba, Sophia Bo, and Priyanka will be representing our class at 8:40 AM in the multipurpose room. *The pie in the face assembly is next Friday which I am sad to miss. If I do end up needing to take a pie in the face, it will be at another time. * Report cards go home this Thursday, I have already met with all students to discuss their grades. They have to decide them first and then we discuss them and make adjustments. Please sign the envelope and send it back to me ASAP. * A two-page article about the Global Read Aloud was published in “Learning & Leading” which is the official magazine for technology in education. This discusses the first year and even has artwork from some of the kids from last years 4/5 class. If you would like to read it, let me know. * I have some dates for you to put on your calendars: Report cards Thursday, December 8th Human Growth and Development is, Dec. 7th and December 14th, the Winter Tea is Wednesday, December 7th 10:35-11:00, Sub (Mrs. Johnston) for Mrs. Ripp December 9th and 12th, Winter Party is December 21st at 1 PM (we are hoping it will be a sledding party) and winter break is from December 22nd through January 2nd.